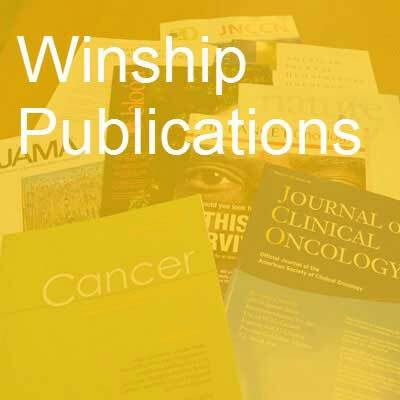 Various first authors and senior authors from Winship Cancer Institute have published 94 studies in major medical and scientific journals in the past month. Marijuana Use and Driving Under the Influence among Young Adults: A Socioecological Perspective on Risk Factors. Berg CJ, Daniel CN, Vu M, Li J, Martin K, Le L. Substance use & misuse. 2018; 53(3):370-380. PubMed PMID: 28777692. Reasons for Marijuana and Tobacco Co-use Among Young Adults: A Mixed Methods Scale Development Study. Berg CJ, Payne J, Henriksen L, Cavazos-Rehg P, Getachew B, Schauer GL, Haardörfer R. Substance use & misuse. 2018; 53(3):357-369. PubMed PMID: 28792283. Resistance training reduces inflammation and fatigue and improves physical function in older breast cancer survivors. Serra MC, Ryan AS, Ortmeyer HK, Addison O, Goldberg AP. Menopause (New York, N.Y.). 2018; 25(2):211-216. PubMed PMID: 28832427; PubMed Central PMCID: PMC5771834. Isolated myeloperoxidase expression in pediatric B/myeloid mixed phenotype acute leukemia is linked with better survival. Raikar SS, Park SI, Leong T, Jaye DL, Keller FG, Horan JT, Woods WG. Blood. 2018; 131(5):573-577. PubMed PMID: 29223952. Living with Symptoms: A Qualitative Study of Black Adults with Advanced Cancer Living in Poverty. Yeager KA, Quest TE, Vena C, Sterk CE. Pain management nursing : official journal of the American Society of Pain Management Nurses. 2018; 19(1):34-45. PubMed PMID: 29249617; PubMed Central PMCID: PMC5807133. Characterizing Autoimmune Disease-associated Diffuse Large B-cell Lymphoma in a SEER-Medicare Cohort. Koff JL, Rai A, Flowers CR. Clinical lymphoma, myeloma & leukemia. 2018; 18(2):e115-e121. PubMed PMID: 29273217. Congress of Neurological Surgeons Systematic Review and Evidence-Based Guidelines on the Treatment of Adults With Vestibular Schwannomas: Executive Summary. Olson JJ, Kalkanis SN, Ryken TC. Neurosurgery. 2018; 82(2):129-134. PubMed PMID: 29309649. The prospects for combination therapy with capecitabine in the rapidly evolving treatment landscape of renal cell carcinoma. Bilen MA, Carlisle JW, Sonpavde G. Expert opinion on investigational drugs. 2018; 27(2):163-170. PubMed PMID: 29323560. Pulmonary Pathologic Manifestations of Anti-Alanyl-tRNA Synthetase (Anti-PL-12)-Related Inflammatory Myopathy. Schneider F, Yousem SA, Oddis CV, Aggarwal R. Archives of pathology & laboratory medicine. 2018; 142(2):191-197. PubMed PMID: 28967806. Intranasal Ketamine and Its Potential Role in Cancer-Related Pain. Singh V, Gillespie TW, Harvey RD. Pharmacotherapy. 2018; PubMed PMID: 29396996. Acquired Hypofibrinogenemia Before Asparaginase Exposure During Induction Therapy for Pediatric Acute Lymphoblastic Leukemia: A Report of 2 Cases and Review of the Literature. Raikar SS, Felker J, Patel KN, Lew G, Sidonio Jr RF. Journal of pediatric hematology/oncology. 2018; PubMed PMID: 29401102. Creating a Clinical Interventional MRI Service. Nour SG, Lewin JS. Topics in magnetic resonance imaging : TMRI. 2018; 27(1):25-31. PubMed PMID: 29406412. NRG oncology RTOG 9006: a phase III randomized trial of hyperfractionated radiotherapy (RT) and BCNU versus standard RT and BCNU for malignant glioma patients. Ali AN, Zhang P, Yung WKA, Chen Y, Movsas B, Urtasun RC, Jones CU, Choi KN, Michalski JM, Fischbach AJ, Markoe AM, Schultz CJ, Penas-Prado M, Garg MK, Hartford AC, Kim HE, Won M, Curran Jr WJ. Journal of neuro-oncology. 2018; PubMed PMID: 29404979. Reasons for initiation of treatment and predictors of response for patients with Rai stage 0/1 chronic lymphocytic leukemia (CLL) receiving first-line therapy: an analysis of the Connect® CLL cohort study. Flowers CR, Nabhan C, Kay NE, Mato A, Lamanna N, Farber CM, Davids MS, Kiselev P, Swern AS, Sullivan K, Flick ED, Sharman JP. Leukemia & lymphoma. 2018; :1-9. PubMed PMID: 29415595. The emerging marijuana retail environment: Key lessons learned from tobacco and alcohol retail research. Berg CJ, Henriksen L, Cavazos-Rehg PA, Haardoerfer R, Freisthler B. Addictive behaviors. 2018; 81:26-31. PubMed PMID: 29421347. Evaluation of Treatment Patterns and Survival Outcomes in Elderly Pancreatic Cancer Patients: A Surveillance, Epidemiology, and End Results-Medicare Analysis. Shaib WL, Jones JS, Goodman M, Sarmiento JM, Maithel SK, Cardona K, Kane S, Wu C, Alese OB, El-Rayes BF. The oncologist. 2018; PubMed PMID: 29445028. A correlative analysis of PD-L1, PD-1, PD-L2, EGFR, HER2, and HER3 expression in oropharyngeal squamous cell carcinoma. Steuer CE, Griffith CC, Nannapaneni S, Patel MR, Liu Y, Magliocca KR, El-Deiry MW, Cohen C, Owonikoko TK, Shin DM, Chen ZG, Saba NF. Molecular cancer therapeutics. 2018; PubMed PMID: 29440293. Trends in transfusion rates after the FOCUS trial. Howard DH, Roback JD, Murphy DJ. Journal of comparative effectiveness research. 2018; PubMed PMID: 29464966. Diablo: A Double-Edged Sword in Cancer? Arbiser JL. Molecular therapy : the journal of the American Society of Gene Therapy. 2018; PubMed PMID: 29472100. A review of mobile apps for epilepsy self-management. Escoffery C, McGee R, Bidwell J, Sims C, Thropp EK, Frazier C, Mynatt ED. Epilepsy & behavior : E&B. 2018; 81:62-69. PubMed PMID: 29494935. Use of CRISPR/Cas9 to model brain diseases. Yan S, Tu Z, Li S, Li XJ. Progress in neuro-psychopharmacology & biological psychiatry. 2018; 81:488-492. PubMed PMID: 28392484; PubMed Central PMCID: PMC5630495. Early evaluation of radiation-induced parotid damage with diffusion kurtosis imaging: a preliminary study. Zhou N, Chen W, Pan X, He J, Yan J, Zhou Z, Yang X. Acta radiologica (Stockholm, Sweden : 1987). 2018; 59(2):212-220. PubMed PMID: 28509567. Socioeconomic and Racial/Ethnic Disparities in Physical Activity Environments in Georgia Elementary Schools. Van Dyke ME, Cheung PC, Franks P, Gazmararian JA. American journal of health promotion : AJHP. 2018; 32(2):453-463. PubMed PMID: 28682137. Uveal Melanoma Nuclear BRCA1-Associated Protein-1 Immunoreactivity Is an Indicator of Metastasis. Szalai E, Wells JR, Ward L, Grossniklaus HE. Ophthalmology. 2018; 125(2):203-209. PubMed PMID: 28823399. Early blood stream infection following allogeneic hematopoietic stem cell transplantation is a risk factor for acute grade III-IV GVHD in children and adolescents. Sano H, Hilinski JA, Qayed M, Applegate K, Newton JG, Watkins B, Chiang KY, Horan J. Pediatric blood & cancer. 2018; 65(2). PubMed PMID: 28921804. Psychosocial and cessation-related differences between tobacco-marijuana co-users and single product users in a college student population. Masters MN, Haardörfer R, Windle M, Berg C. Addictive behaviors. 2018; 77:21-27. PubMed PMID: 28941933; PubMed Central PMCID: PMC5701838. Psychometric Analysis of the Parenting Concerns Questionnaire in Women With Metastatic Cancer. Park EM, Tan X, Stephenson EM, Deal AM, Yopp JM, Rosenstein DL, Edwards T, Song MK. Journal of pain and symptom management. 2018; 55(2):451-457. PubMed PMID: 28947143; PubMed Central PMCID: PMC5794505. Whole lung irradiation in stage IV Wilms tumor patients: Thyroid dosimetry and outcomes. Morgan TM, Danish H, Nanda RH, Esiashvili N, Meacham LR. Pediatric blood & cancer. 2018; 65(2). PubMed PMID: 28960781. Clinical responses of patients with diffuse leptomeningeal glioneuronal tumors to chemotherapy. Aguilera D, Castellino RC, Janss A, Schniederjan M, McNall R, MacDonald T, Mazewski C. Child's nervous system : ChNS : official journal of the International Society for Pediatric Neurosurgery. 2018; 34(2):329-334. PubMed PMID: 28965234. Massage therapy decreases cancer-related fatigue: Results from a randomized early phase trial. Kinkead B, Schettler PJ, Larson ER, Carroll D, Sharenko M, Nettles J, Edwards SA, Miller AH, Torres MA, Dunlop BW, Rakofsky JJ, Rapaport MH. Cancer. 2018; 124(3):546-554. PubMed PMID: 29044466; PubMed Central PMCID: PMC5780237. Neck Imaging Reporting and Data System. Aiken AH, Hudgins PA. Magnetic resonance imaging clinics of North America. 2018; 26(1):51-62. PubMed PMID: 29128006. Lysophosphatidic Acid Receptor 1 Is Important for Intestinal Epithelial Barrier Function and Susceptibility to Colitis. Lin S, Han Y, Jenkin K, Lee SJ, Sasaki M, Klapproth JM, He P, Yun CC. The American journal of pathology. 2018; 188(2):353-366. PubMed PMID: 29128569. Morbidity and Outcomes Following Axillary Lymphadenectomy for Melanoma: Weighing the Risk of Surgery in the Era of MSLT-II. Postlewait LM, Farley CR, Seamens AM, Le N, Rizzo M, Russell MC, Lowe MC, Delman KA. Annals of surgical oncology. 2018; 25(2):465-470. PubMed PMID: 29159743. A Novel T-Stage Classification System for Adrenocortical Carcinoma: Proposal from the US Adrenocortical Carcinoma Study Group. Poorman CE, Ethun CG, Postlewait LM, Tran TB, Prescott JD, Pawlik TM, Wang TS, Glenn J, Hatzaras I, Shenoy R, Phay JE, Keplinger K, Fields RC, Jin LX, Weber SM, Salem A, Sicklick JK, Gad S, Yopp AC, Mansour JC, Duh QY, Seiser N, Solórzano CC, Kiernan CM, Votanopoulos KI, Levine EA, Staley CA, Poultsides GA, Maithel SK. Annals of surgical oncology. 2018; 25(2):520-527. PubMed PMID: 29164414. The gut microbiome, symptoms, and targeted interventions in children with cancer: a systematic review. Bai J, Behera M, Bruner DW. Supportive care in cancer : official journal of the Multinational Association of Supportive Care in Cancer. 2018; 26(2):427-439. PubMed PMID: 29168036. Percutaneous Image-Guided Cryoneurolysis. Bittman RW, Peters GL, Newsome JM, Friedberg EB, Mitchell JW, Knight JM, Prologo JD. AJR. American journal of roentgenology. 2018; 210(2):454-465. PubMed PMID: 29220211. Mapping the 3D orientation of piconewton integrin traction forces. Brockman JM, Blanchard AT, Pui-Yan Ma V, Derricotte WD, Zhang Y, Fay ME, Lam WA, Evangelista FA, Mattheyses AL, Salaita K. Nature methods. 2018; 15(2):115-118. PubMed PMID: 29256495. In-bore MRI-guided biopsy: can it optimize the need for periodic biopsies in prostate cancer patients undergoing active surveillance? A pilot test-retest reliability study. Elfatairy KK, Filson CP, Sanda MG, Osunkoya AO, Geller RL, Nour SG. The British journal of radiology. 2018; :20170603. PubMed PMID: 29308912. Congress of Neurological Surgeons Systematic Review and Evidence-Based Guidelines on Surgical Resection for the Treatment of Patients With Vestibular Schwannomas. Hadjipanayis CG, Carlson ML, Link MJ, Rayan TA, Parish J, Atkins T, Asher AL, Dunn IF, Corrales CE, Van Gompel JJ, Sughrue M, Olson JJ. Neurosurgery. 2018; 82(2):E40-E43. PubMed PMID: 29309632. Congress of Neurological Surgeons Systematic Review and Evidence-Based Guidelines on the Role of Radiosurgery and Radiation Therapy in the Management of Patients With Vestibular Schwannomas. Germano IM, Sheehan J, Parish J, Atkins T, Asher A, Hadjipanayis CG, Burri SH, Green S, Olson JJ. Neurosurgery. 2018; 82(2):E49-E51. PubMed PMID: 29309637. Congress of Neurological Surgeons Systematic Review and Evidence-Based Guidelines on Intraoperative Cranial Nerve Monitoring in Vestibular Schwannoma Surgery. Vivas EX, Carlson ML, Neff BA, Shepard NT, McCracken DJ, Sweeney AD, Olson JJ. Neurosurgery. 2018; 82(2):E44-E46. PubMed PMID: 29309641. Congress of Neurological Surgeons Systematic Review and Evidence-Based Guidelines on Pathological Methods and Prognostic Factors in Vestibular Schwannomas. Sughrue ME, Fung KM, Van Gompel JJ, Peterson JEG, Olson JJ. Neurosurgery. 2018; 82(2):E47-E48. PubMed PMID: 29309662. Congress of Neurological Surgeons Systematic Review and Evidence-Based Guidelines on Emerging Therapies for the Treatment of Patients With Vestibular Schwannomas. Van Gompel JJ, Agazzi S, Carlson ML, Adewumi DA, Hadjipanayis CG, Uhm JH, Olson JJ. Neurosurgery. 2018; 82(2):E52-E54. PubMed PMID: 29309638. Congress of Neurological Surgeons Systematic Review and Evidence-Based Guidelines on the Role of Imaging in the Diagnosis and Management of Patients With Vestibular Schwannomas. Dunn IF, Bi WL, Mukundan S, Delman BN, Parish J, Atkins T, Asher AL, Olson JJ. Neurosurgery. 2018; 82(2):E32-E34. PubMed PMID: 29309686. Congress of Neurological Surgeons Systematic Review and Evidence-Based Guidelines on Otologic and Audiologic Screening for Patients With Vestibular Schwannomas. Sweeney AD, Carlson ML, Shepard NT, McCracken DJ, Vivas EX, Neff BA, Olson JJ. Neurosurgery. 2018; 82(2):E29-E31. PubMed PMID: 29309699. Congress of Neurological Surgeons Systematic Review and Evidence-Based Guidelines on Hearing Preservation Outcomes in Patients With Sporadic Vestibular Schwannomas. Carlson ML, Vivas EX, McCracken DJ, Sweeney AD, Neff BA, Shepard NT, Olson JJ. Neurosurgery. 2018; 82(2):E35-E39. PubMed PMID: 29309683. Health care disparities among octogenarians and nonagenarians with stage III lung cancer. Cassidy RJ, Zhang X, Switchenko JM, Patel PR, Shelton JW, Tian S, Nanda RH, Steuer CE, Pillai RN, Owonikoko TK, Ramalingam SS, Fernandez FG, Force SD, Gillespie TW, Curran WJ, Higgins KA. Cancer. 2018; 124(4):775-784. PubMed PMID: 29315497; PubMed Central PMCID: PMC5801133. Commentary on Seyla et al. (2018): Advantages in the consideration of causal mechanisms for studies of gateway e-cigarette use. Cahn Z, Berg CJ. Addiction (Abingdon, England). 2018; 113(2):334-335. PubMed PMID: 29314402. IL-6 and PD-L1 antibody blockade combination therapy reduces tumour progression in murine models of pancreatic cancer. Mace TA, Shakya R, Pitarresi JR, Swanson B, McQuinn CW, Loftus S, Nordquist E, Cruz-Monserrate Z, Yu L, Young G, Zhong X, Zimmers TA, Ostrowski MC, Ludwig T, Bloomston M, Bekaii-Saab T, Lesinski GB. Gut. 2018; 67(2):320-332. PubMed PMID: 27797936; PubMed Central PMCID: PMC5406266. Aerobic, Diselenide-Catalyzed Redox Dehydration: Amides and Peptides. Akondi SM, Gangireddy P, Pickel TC, Liebeskind LS. Organic letters. 2018; 20(3):538-541. PubMed PMID: 29323920. Click, Release, and Fluoresce: A Chemical Strategy for a Cascade Prodrug System for Codelivery of Carbon Monoxide, a Drug Payload, and a Fluorescent Reporter. De La Cruz LKC, Benoit SL, Pan Z, Yu B, Maier RJ, Ji X, Wang B. Organic letters. 2018; 20(4):897-900. PubMed PMID: 29380605. Degradation of Organophosphorus and Pyrethroid Insecticides in Beverages: Implications for Risk Assessment. Radford SA, Panuwet P, Hunter Jr RE, Barr DB, Ryan PB. Toxics. 2018; 6(1). PubMed PMID: 29393904. Improving T-cell expansion and function for adoptive T-cell therapy using ex vivo treatment with PI3Kδ inhibitors and VIP antagonists. Petersen CT, Hassan M, Morris AB, Jeffery J, Lee K, Jagirdar N, Staton AD, Raikar SS, Spencer HT, Sulchek T, Flowers CR, Waller EK. Blood advances. 2018; 2(3):210-223. PubMed PMID: 29386194. Clinical Impact of PI3K/BRAF Mutations in RAS Wild Metastatic Colorectal Cancer: Meta-analysis Results. Mohamed A, Twardy B, AbdAllah N, Akhras A, Ismail H, Zordok M, Schrapp K, Attumi T, Tesfaye A, El-Rayes B. Journal of gastrointestinal cancer. 2018; PubMed PMID: 29388061. "Research on Infertility: Definition Makes a Difference" Revisited. Jacobson MH, Chin HB, Mertens AC, Spencer JB, Fothergill A, Howards PP. American journal of epidemiology. 2018; 187(2):337-346. PubMed PMID: 28633422. Visualization of the Cellular Uptake and Trafficking of DNA Origami Nanostructures in Cancer Cells. Wang P, Rahman MA, Zhao Z, Weiss K, Zhang C, Chen Z, Hurwitz SJ, Chen ZG, Shin DM, Ke Y. Journal of the American Chemical Society. 2018; 140(7):2478-2484. PubMed PMID: 29406750. A Multivariate Analysis of Adverse Childhood Experiences and Health Behaviors and Outcomes among College Students. Windle M, Haardörfer R, Getachew B, Shah J, Payne J, Pillai D, Berg CJ. Journal of American college health : J of ACH. 2018; :0. PubMed PMID: 29405856. Treatment and survival vary by race/ethnicity in patients with anaplastic thyroid cancer. Roche AM, Fedewa SA, Shi LL, Chen AY. Cancer. 2018; PubMed PMID: 29409119. A microengineered vascularized bleeding model that integrates the principal components of hemostasis. Sakurai Y, Hardy ET, Ahn B, Tran R, Fay ME, Ciciliano JC, Mannino RG, Myers DR, Qiu Y, Carden MA, Baldwin WH, Meeks SL, Gilbert GE, Jobe SM, Lam WA. Nature communications. 2018; 9(1):509. PubMed PMID: 29410404; PubMed Central PMCID: PMC5802762. Early evaluation of radiation-induced parotid damage in patients with nasopharyngeal carcinoma by T2 mapping and mDIXON Quant imaging: initial findings. Zhou N, Chu C, Dou X, Chen W, He J, Yan J, Zhou Z, Yang X. Radiation oncology (London, England). 2018; 13(1):22. PubMed PMID: 29422068; PubMed Central PMCID: PMC5806279. First international TNBC conference meeting report. Rida P, Ogden A, Ellis IO, Varga Z, Wolff AC, Traina TA, Hatzis C, Palmer JR, Ambrosone CB, Lehmann BD, Nanda R, Montgomery Rice V, Brawley OW, Torres MA, Rakha E, Aneja R. Breast cancer research and treatment. 2018; PubMed PMID: 29417299. T-cell receptor activator of nuclear factor-κB ligand/osteoprotegerin imbalance is associated with HIV-induced bone loss in patients with higher CD4+ T-cell counts. Titanji K, Vunnava A, Foster A, Sheth AN, Lennox JL, Knezevic A, Shenvi N, Easley KA, Ofotokun I, Weitzmann MN. AIDS (London, England). 2018; PubMed PMID: 29424771. Trends in Kindergarten Rates of Vaccine Exemption and State-Level Policy, 2011-2016. Omer SB, Porter RM, Allen K, Salmon DA, Bednarczyk RA. Open forum infectious diseases. 2018; 5(2):ofx244. PubMed PMID: 29423420; PubMed Central PMCID: PMC5798011. Intranasal oxytocin modulates neural functional connectivity during human social interaction. Rilling JK, Chen X, Haroon E. American journal of primatology. 2018; PubMed PMID: 29427292. Salivary Levels of Angiopoietin 2 in Infants with Infantile Hemangiomas Treated with and without Systemic Propranolol. Seamens A, Nieman E, Losavio K, Bradley B, Nelson K, Chen KH, Chen S, Arbiser J, Lawley LP. Experimental dermatology. 2018; PubMed PMID: 29427463. Use of Long-Acting Reversible Contraception Among Adolescent and Young Adult Women and Receipt of Sexually Transmitted Infection/Human Immunodeficiency Virus-Related Services. Steiner RJ, Pazol K, Swartzendruber A, Liddon N, Kramer MR, Gaydos LM, Sales JM. The Journal of adolescent health : official publication of the Society for Adolescent Medicine. 2018; PubMed PMID: 29428823. Impact of cancer treatment on risk of infertility and diminished ovarian reserve in women with polycystic ovary syndrome. Shandley LM, Fothergill A, Spencer JB, Mertens AC, Cottrell HN, Howards PP. Fertility and sterility. 2018; PubMed PMID: 29428311. Active Stiffness Tuning of a Spring-based Continuum Robot for MRI-Guided Neurosurgery. Kim Y, Cheng SS, Desai JP. IEEE transactions on robotics : a publication of the IEEE Robotics and Automation Society. 2018; 34(1):18-28. PubMed PMID: 29434530; PubMed Central PMCID: PMC5806630. The Multi-Billion Dollar Drug-Sensitive Spending Opportunity. Easter JC, Thorpe K. North Carolina medical journal. 2018; 79(1):46-50. PubMed PMID: 29439105. Pharmacokinetic-pharmacodynamic correlations in the development of ginger extract as an anticancer agent. Mukkavilli R, Yang C, Tanwar RS, Saxena R, Gundala SR, Zhang Y, Ghareeb A, Floyd SD, Vangala S, Kuo WW, Rida PCG, Aneja R. Scientific reports. 2018; 8(1):3056. PubMed PMID: 29445099; PubMed Central PMCID: PMC5813242. Phase 1b study of pasireotide, everolimus, and selective internal radioembolization therapy for unresectable neuroendocrine tumors with hepatic metastases. Kim HS, Shaib WL, Zhang C, Nagaraju GP, Wu C, Alese OB, Chen Z, Brutcher E, Renfroe M, El-Rayes BF. Cancer. 2018; PubMed PMID: 29451701. Clinical and Genomic Correlates of Neutrophil Reactive Oxygen Species Production in Pediatric Patients with Crohn's Disease. Denson LA, Jurickova I, Karns R, Shaw KA, Cutler DJ, Okou D, Dodd A, Quinn K, Mondal K, Aronow BJ, Haberman Y, Linn A, Price A, Bezold R, Lake K, Jackson K, Walters TD, Griffiths A, Baldassano RN, Noe JD, Hyams JS, Crandall WV, Kirschner BS, Heyman MB, Snapper S, Guthery SL, Dubinsky MC, Leleiko NS, Otley AR, Xavier RJ, Stevens C, Daly MJ, Zwick ME, Kugathasan S. Gastroenterology. 2018; PubMed PMID: 29454792. Outpatient Management of Fever and Neutropenia in Adults Treated for Malignancy: American Society of Clinical Oncology and Infectious Diseases Society of America Clinical Practice Guideline Update. Taplitz RA, Kennedy EB, Bow EJ, Crews J, Gleason C, Hawley DK, Langston AA, Nastoupil LJ, Rajotte M, Rolston K, Strasfeld L, Flowers CR. Journal of clinical oncology : official journal of the American Society of Clinical Oncology. 2018; :JCO2017776211. PubMed PMID: 29461916. Association Between Gender Confirmation Treatments and Perceived Gender Congruence, Body Image Satisfaction, and Mental Health in a Cohort of Transgender Individuals. Owen-Smith AA, Gerth J, Sineath RC, Barzilay J, Becerra-Culqui TA, Getahun D, Giammattei S, Hunkeler E, Lash TL, Millman A, Nash R, Quinn VP, Robinson B, Roblin D, Sanchez T, Silverberg MJ, Tangpricha V, Valentine C, Winter S, Woodyatt C, Song Y, Goodman M. The journal of sexual medicine. 2018; PubMed PMID: 29463478. Validation of a customized bioinformatics pipeline for a clinical next-generation sequencing test targeting solid tumor-associated variants. Schneider T, Smith GH, Rossi MR, Hill CE, Zhang L. The Journal of molecular diagnostics : JMD. 2018; PubMed PMID: 29471113. Organizational Strategies Partially Account for Race-related Differences in List Recall Performance. Fox ME, Panwala TF, King TZ. Archives of clinical neuropsychology : the official journal of the National Academy of Neuropsychologists. 2018; PubMed PMID: 29474511. Radiographic Analysis of the Vidian Canal and Its Utility in Petrous Internal Carotid Artery Localization. Mason EC, Hudgins PA, Pradilla G, Oyesiku NM, Solares CA. Operative neurosurgery (Hagerstown, Md.). 2018; PubMed PMID: 29474662. Ethnic Differences in TGFβ Signaling Pathway May Contribute to Prostate Cancer Health Disparity. Elliott B, Zackery DL, Eaton VA, Jones RT, Abebe F, Ragin CC, Khan SA. Carcinogenesis. 2018; PubMed PMID: 29474521. Risk of Readmission After Uncomplicated Hospitalization After Radical Cystectomy. Lorentz CA, Gilbert K, Alemozaffar M, Patil D, Filson CP. Clinical genitourinary cancer. 2018; PubMed PMID: 29478962. Balancing patient value and payer cost in hematologic malignancies: can it be done? Allen PB, Flowers CR. Expert review of pharmacoeconomics & outcomes research. 2018; PubMed PMID: 29486601. A direct comparison of in vitro and in vivo nucleic acid delivery mediated by hundreds of nanoparticles reveals a weak correlation. Paunovska K, Sago CD, Monaco CM, Hudson WH, Gamboa Castro M, Rudoltz TG, Kalathoor S, Vanover DA, Santangelo PJ, Ahmed R, Bryskin AV, Dahlman J. Nano letters. 2018; PubMed PMID: 29489381. Higher Mediterranean Diet Quality Scores and Lower Body Mass Index Are Associated with a Less-Oxidized Plasma Glutathione and Cysteine Redox Status in Adults. Bettermann EL, Hartman TJ, Easley KA, Ferranti EP, Jones DP, Quyyumi AA, Vaccarino V, Ziegler TR, Alvarez JA. The Journal of nutrition. 2018; 148(2):245-253. PubMed PMID: 29490099. Potency Analysis of Mesenchymal Stromal Cells Using a Combinatorial Assay Matrix Approach. Chinnadurai R, Rajan D, Qayed M, Arafat D, Garcia M, Liu Y, Kugathasan S, Anderson LJ, Gibson G, Galipeau J. Cell reports. 2018; 22(9):2504-2517. PubMed PMID: 29490284. Developing DNA methylation-based diagnostic biomarkers. Kim H, Wang X, Jin P. Journal of genetics and genomics = Yi chuan xue bao. 2018; PubMed PMID: 29496486. Telemedicine and eHealth in Poland from 1995 to 2015. Glinkowski WM, Karlińska M, Karliński M, Krupiński EA. Advances in clinical and experimental medicine : official organ Wroclaw Medical University. 2018; 27(2):277-282. PubMed PMID: 29521073. Fabry disease revisited: Management and treatment recommendations for adult patients. Ortiz A, Germain DP, Desnick RJ, Politei J, Mauer M, Burlina A, Eng C, Hopkin RJ, Laney D, Linhart A, Waldek S, Wallace E, Weidemann F, Wilcox WR. Molecular genetics and metabolism. 2018; PubMed PMID: 29530533.